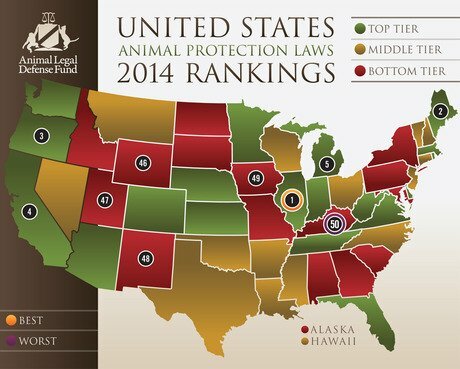 For the fifth year in a row, Kentucky ranked dead last for animal protection laws in America, while Illinois was ranked the best for the sixth year in row, according to a yearly report issued by the Animal Legal Defense Fund. A non-profit organization, the ALDF examines animal protection laws in each American territory. The annual report is based on each state’s existing laws and does not take into account the conduct of its animal rescue groups and organizations or the conditions of its shelters. Compared with the results of the 2013 report, the lineup of states in the 2014 “Best” category remained the same, albeit in a different order. Oregon went from 2nd to 3rd; Michigan moved from 3rd to 5th, Maine went from 4th to 2nd, and California rose a notch from 5th to 4th. Dubbed the “Top Five States to be an Animal Abuser” — the “Worst” states category — South Dakota moved out of the list (it now ranks 40), making way for Utah, which entered the bottom five at 47. South Dakota strengthened its rating by adding a statewide ban on breed-specific legislation and instituting felony penalties for cases that involve torture or extreme animal cruelty. One notable trend in the 2014 report is the increase in laws to battle breed-specific legislation (BSL). According to the report, 19 states now have laws on the books that prohibit states from outlawing particular dogs solely because they are of a certain breed. “Breed-specific legislation is hardly a ‘quick-fix’ to dangerous dog issues,” Scott Heiser, director of ALDF’s Criminal Justice Program, says. “It takes a nuanced approach to tackle dangerous dog problems, including educating and addressing reckless dog owners who put their dogs and the public at risk. The 2014 report also notes that in the past five years, 28 percent of jurisdictions improved 2-10 percent; 50 percent of jurisdictions improved 11-50 percent; and 4 percent of jurisdictions improved by more than 50 percent. The full report, including how Canada’s animal protection laws fared in 2014, is on the Animal Legal Defense Fund’s official website.